Newcastle United goalkeeper Martin Dubravka insists that he will continue to fight for every point as the Premier League season nears its end. The Slovakian stopper put in another eye-catching display during the Magpies’ trip to Watford despite the 2-1 defeat at Vicarage Road. Martin Dubravka denies Troy Deeney from the penalty rebound. 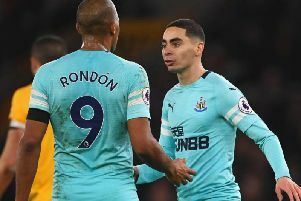 Dubravka’s penalty save from Troy Deeney proved the catalyst for a much-improved second half for Rafa Benitez’s side, but they were still left to rue a slow start which saw the Hornets two goals up inside the opening half hour. “We didn’t start well unfortunately, but in the second half we showed our good side,” said Dubravka, speaking to nufc.co.uk. “If we play like we did in the second half then we can be successful but unfortunately 45 minutes isn’t enough. “We gave them too much space and they created the chances. “We didn’t play well in the first half so we have to work on it. At the start of the game we spoke about playing with a high press and being active on the pitch but we didn’t do that. Dubravka’s fine double save from Deeney’s penalty was another highlight for the Slovakian during a successful loan spell at St James’s Park. “I’m trying to help the guys because if we had conceded another one it would have been very difficult for us,” he admitted. With just two games left during his temporary spell on Tyneside, Dubravka is keen to continue impressing as he looks to seal a permanent switch. And the Slovakia international said that his side will continue to fight for points and for each other in the final 180 minutes.